I used to love my mum’s homemade chicken schnitzels. I’d come back from school and ask what was for dinner and I would just melt when she would tell me schnitzels. I’d hover over her as she would shallow fry them and I would help by being the ‘Chief Quality Control Officer’, just eating one after another, and trying to find some non-existent fault in them just to snag another piece. Now my kids do the same, but with a difference. Due to allergies and intolerances I’ve replaced the white breadcrumbs with almond meal or quinoa flakes. And for my youngest, due to his egg allergy I replace the egg for dredging with melted coconut or olive oil. It comes out just as well. They have tremendous flavour thanks to the blend of ground spices and generous seasoning. Ill often make a double batch and freeze half of the ready made (uncooked) schnitzels for another time for a quick mid week dinner. 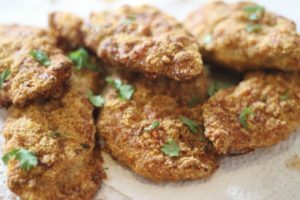 Share the post "Paleo Chicken Schnitzels"
Allergies: DF, SF, WF, GF. Contains almonds. Can be egg free by replacing egg with coconut or olive oil. Paleo. 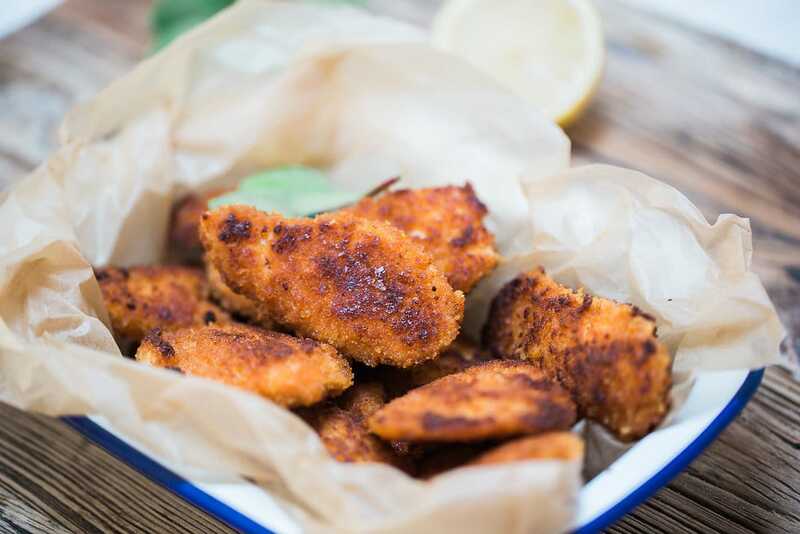 If you’re baking the nuggets preheat the oven to 190C or 375F and line a baking tray with parchment paper (just to make the washing up a bit easier). Alternatively you can shallow fry these. Slice the chicken breasts into thin 5 cm long pieces and set aside or if using chicken tenderloins keep them as they are. Break the eggs into a bowl and give them a whisk until well combined. Alternatively for egg allergies add your oil into this bowl and set aside. In another bowl or plate mix together the rice crumbs, almond meal or quinoa flakes, the spices and seasoning and give it a good mix with your hands and set aside with the other bowls. Now your ready to prepare the nuggets. In batches dip the chicken strips into the egg or oil (I do a handful at a time). Next individually coat each chicken slice in the flavoured crumb mixture on both sides so they are evenly coated and then set aside on another plate or on the baking tray (if baking). Repeat with all chicken pieces until they are all ready to be cooked. If frying, heat oil in a large, deep frying pan over medium heat. Test the heat of the oil by placing a small piece of chicken in the pan. When the oil has reached the prefect heat the oil will sizzle around the chicken and you can then fry more pieces at the same time. Cook in batches and for about 3 minutes each side until they are golden brown and the chicken is cooked through. Remove the nuggets from the pan using a fork or tongs and drain on paper towels. Alternatively if you are baking the nuggets pop them in the oven to cook for 20-25 minutes, until golden and cooked through. Recipe Information: Dairy, soy, gluten, wheat free, nut and peanut free. Can be made egg free.